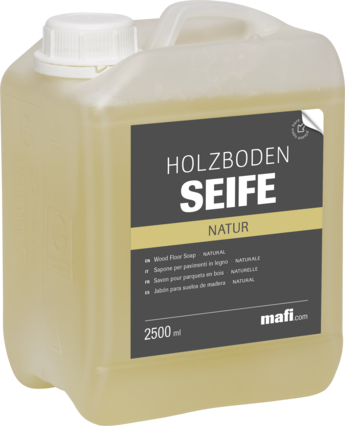 The highly concentrated Soap is used for the simultaneous cleaning and care of mafi natural wooden floors. The wooden floor soap is the congenial partner for a mafi typical open-pored surface. Through regular use, the floor is not only cleaned but it also increases the robustness and supports the wood’s own regeneration. The wooden floor soap is available for every suitable mafi natural wooden floor. Depending on the colour of the wooden floor oil used for finishing, the corresponding soap is chosen. Natural, White and Grey versions are available. The soap is applied together with warm water and a cotton cleaning mop to the floor. Ideally, the mixing ratio is 125ml to 5l of warm water. The wiping process is performed with two buckets: one with the clean soapy water mix and the other with clear water to wash out the mops. Further information on the wiping process can be found here. The mafi wooden floor soap contains a very high fat content. This delivers a protective effect against deep dirt through repeated application. The dirt is bound to the soap and simply washed out in the next wiping process. 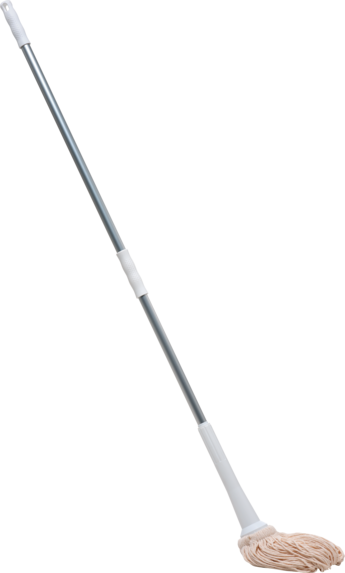 The wood fibres thus remain supple from the fat and break off far less easily when hit. The advantage here is that the compressed wood fibres can stand up again - small dents and scratches also disappear. The soap also has an antibacterial and antiseptic effect that keeps your floor hygienic without having to use artificial substances. The water that is absorbed into the wood during the wiping process can easily escape thanks to the porous surface, and thus improves the room climate. Choosing the right wooden floor soap from the mafi range also presents an opportunity to customise the colour of the wooden floor. Furnishings or even the walls change over the course of decades. The floor then doesn’t always still fit into the colour concept. The mafi wooden floor soap can change the base tone of the floor in nuances. So, as an example you can lighten natural oiled floors through regular care with the mafi white wooden floor soap. The result can be reversed over time with the use of the natural wooden floor soap. A great opportunity to add small but often significant accentuations.